Lord Morris was raised to the peerage as Baron Morris of Handsworth, of Handsworth in the County of West Midlands in 2006. He is affiliated with the Labour Party. Lord Morris of Handsworth was educated at Mizpah School in Jamaica, and Handsworth Technical College where he attained a qualification in Mechanical Engineering. 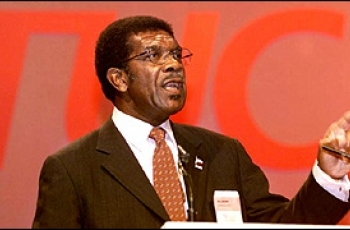 Lord Morris was General Secretary of the Transport and General Workers' Union from 1992 to 2003, and was the first black leader of a major British trade union. He was honoured with an OJ (Order of Jamaica) in 2002 and a KBE (Commander of the Order) of the British Empire in 2003. Lord Morris is a trustee of numerous medical, charitable, economic, and judiciary organisations. He served as a member of the Human Rights Committee and Adoption Legislation Committee and currently serves as a member of the Statutory Instruments Joint Committee. He married Minetta Smith in 1957 (who died in 1990), with whom he had two sons. His current partner is Eileen Ware.